Perhaps that’s why audiences are so receptive to Hamill’s seemingly boundless reserve of dad jokes. On Thursday’s Jimmy Kimmel Live!, Hamill returned (after granting Star Wars geek Adam Scott’s fondest wish a while back) to goof amiably on himself, his cinematic bread-and-butter, and rabid Star Wars fandom. 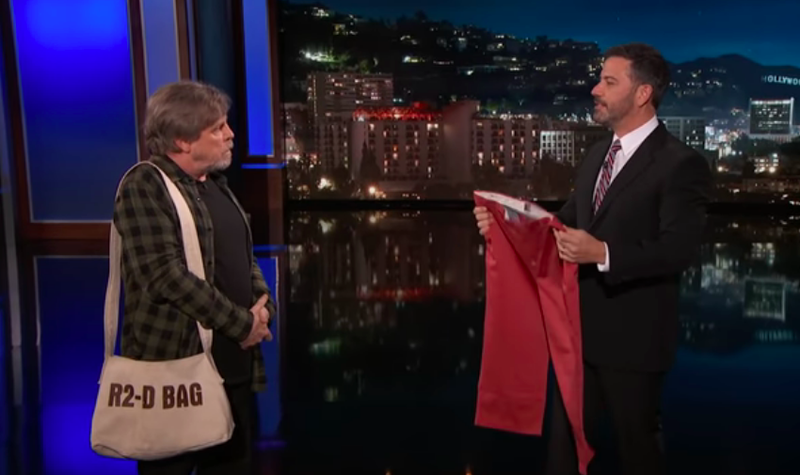 Bearing a shoulder satchel emblazoned with “R2-D Bag,” Hamill interrupted Kimmel’s monologue jokes about the anticipated million-dollar-plus auction price for Harrison Ford’s Empire Strikes Back jacket to pitch some of his own used duds. (While Hamill was justly praised for his return as Luke Skywalker in The Last Jedi, he doesn’t exactly have Ford money, people.) And, sure, maybe you don’t remember Luke’s cranberry-colored capri pants from the same movie, but Hamill resolutely assured everyone that he wore those “Padawan pedal-pushers” both while floating rocks and fighting “Dad Vader,” and who are you gonna believe, Luke Skywalker or your lyin’ eyes? (Also, see: dad jokes.) Finding no takers, Hamill attempted to sweeten the deal with some distressingly intimate Chewbacca merch before calling for a quick, resentful extraction—from another franchise entirely.